The little trout stream where my last fishing trip of 2010 took place. As this year comes to a close I can say for the most part it was a good year. I had a profound change happen to me in early November. In a short few minutes I experienced the bad and the very good in our society. And it changed the way I now look at my life. 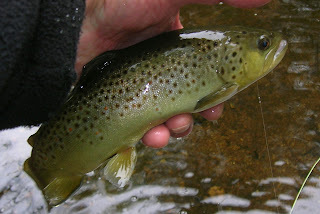 My fishing outings have been great, lots of new flies used, but I seem to stay with the old familiar patterns. I found myself fishing dry flies, more and more, where in the past almost alway's the streamer was tied on first. So as I close out 2010, my wife Jeanette and I are looking foward to a tradition of ours that go's back many years. Every New Years Eve we select a restaurant and go out and to enjoy a "Burger", with all the trimmings. We will arrive at around 5pm, place our order and enjoy this special Burger. We come home and have a beverage of choice, watch the TV for a while and turn in for the night. Jeanette has to be at work at 4am so there are not to many late nights. This has worked for us so very well. 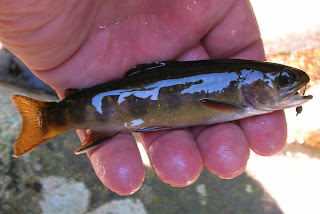 As for the fishing report for the last outing of 2010, I would love to show a photo of a beautiful wild trout. That did not happen. I had only one hookup on that day, and the fish never came to hand. It was still a special and memorable day. 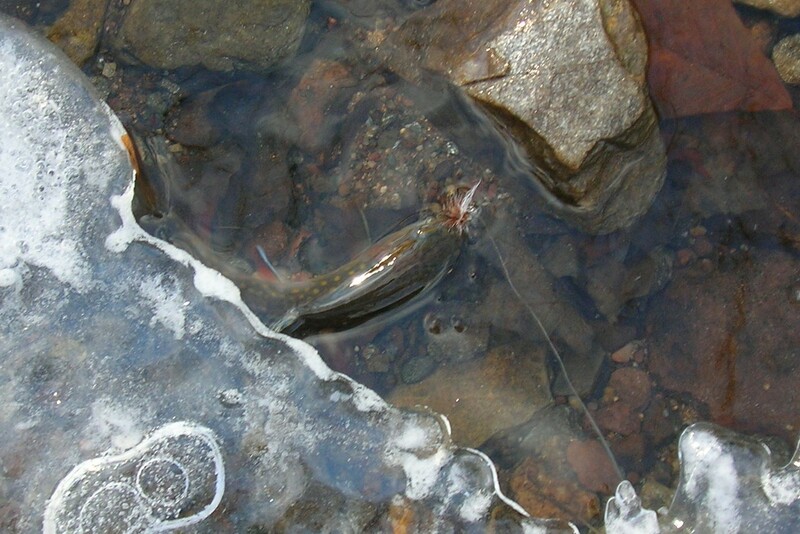 Just under the log, in front of the large stone to the right of the photo, as the Picket Pin came to a stop one of those precious residents of the stream hit the fly. A slight skirmish and it was gone. One of my favorite foods of 2010, Meatballs. Heck its one of my favorite foods of all time. I tied these up a few weeks ago. They are mini versions of a Wooly Bugger. 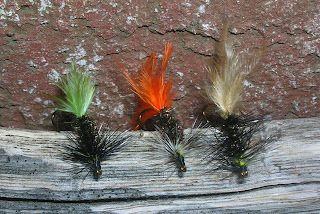 They are tied using peacock herl as a body, and a bit of yellow dubbing near the heads. I ahve not fished these as of yet but plan on doing so in a few days. Body, Peacock Herl,Yellow Dubbing Near Head. You Should Have Been Here Yesterday, "I Was"
This large stone has an impact on the water in this stream. Anyone care to guess what it is? Monday I was trying to choose which day to fish, it was either Wed. or Thur. I chose Wed and for me it was the better day, weather wise that is. There was a bit more sunshine and the wind was much less. The fish helped out too. The long range weather looking into next week not so good. SNOW....... Oh Well. An accomadating brookie. A dry fly, care to guess what fly? The Land of Little Rivers, by, Austin McK. Francis is one of the finest books I have ever read. It's detailed history and photographs of the Catskill region are spectacular. It covers the rivers, the people, the beautiful dry flies and the tyers who created them. It has a section on the bamboo rods of the era, as well as their makers. If you have the opportunity to read this book please do so, you won't be disapointed. Saturday was one of those moderating days in December where the air temps reach 35 to 40, no wind and bright sunshine which make for a good feel to the body. I started fishing this Class 1 stream further down than I normally fish it, in fact parts I've never really fished. 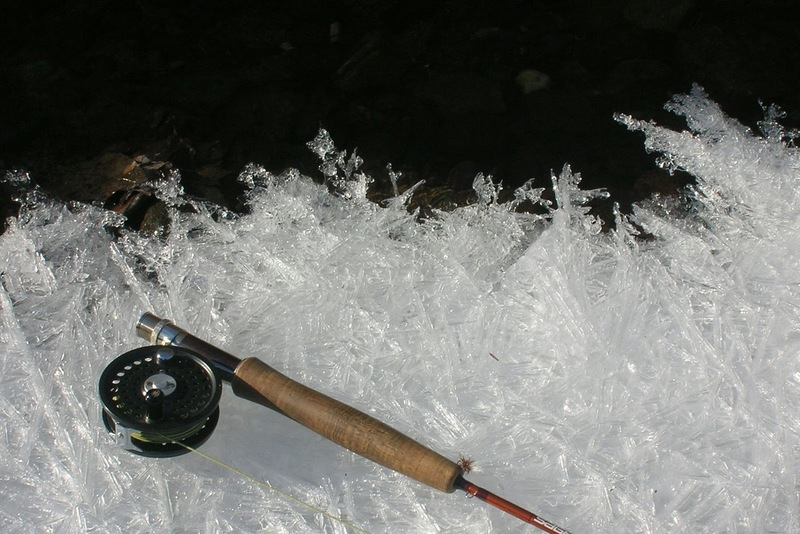 A BHPT was my first fly and after a few drifts there was that little bump that signals a hit. As I lifted up the 3wt Sage I felt the fish. As I retrieved it I could see it was a nice brown. When reaching for him he delivered the fly to me and off he went. I continued to fish the nymph with out much success. I changed flies and tied on a "Ausable Bomber", its so much easier to follow than the PT, and not as many bottom snags. After several drifts through the pool I had a fish rise. It was a very subtle move but a rise none the less. Another few drifts and I had my first hookup on the "Bomber" and the first fish to hand. It was a lovely brookie. I continued to have success on the dry with many rises and quite a few fish to hand. This was a good day on the stream, and considering it was December 18th, maybe it was one of the best of the year. 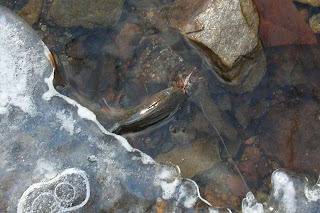 Wild brookie's on the "Bomber"
A few years ago while viewing a post on "smallstreams.com" I was taken by a series of emergers tied in reverse. They were beautiful looking flies and had the look of Fish Taker. These flies were tied by a inovative and very talented master fly tyer from England, his name is Roy Christie. I communicated with Roy and purchased several of his patterns. Upon recieving them I did a through inspection of them, trying to figure out his way of tying them. It was not an easy time of it when I sat down at the bench and attempted to duplicate the flies. My copies were not close to his, but appeared OK to fish. On numerous trips I fish the two, Roy's and mine. The results were about 50/50, the diference was I was able to fool a few wary browns on The Farmy using Roy's because of their smaller size. I still tie these and fish them often,and perhaps I could someday see exactly how he ties them. They are a great pattern. As 2010 comes to a close I'll be posting some of the photos I've taken this year. While they maybe not the best photos I've taken they have a place in my mind and a memory or two going along with them. I hope you'll enjoy. In a post that I did in August about a fly rod that I believe to be the finest small stream rod ever made. The Orvis Small Stream Special has been with me on little waters along the east, and has served me well. Unfortunately on a previous outing I managed to break the tip. I felt bad about it and considered just retiering it to a place along the tying bench. I know about the warranty Orvis has on their rods so I brought the rod over to the Orvis Retail shop in Avon CT. That was a wonderful visit. Andy who was in the shop greeted me and my wife and asked if he could help. Explaining to him the trouble my rod was in. He took my info and proceeded to write up the repair order. The rod was placed in the tube and Andy assured me of its shipping to Orvis for repair. While in the shop we were invited to enjoy some hot apple cider, and listen to a group of women sing some wonderful songs. I believe that this is whats needed more of in this season as well as the rest of the year. Well done Andy, and the staff at Orvis of Avon. This is my broken friend. I had tied this pattern,"Yellow Palmer" from Roger Lowe's book. I was dying for the opportunity to float a few, so yesterday I did just that. The air temp was in the mid forties with on and off sunshine. Taking the water temp I found it to be 42 degrees. The stream was clear with lots of leaf jams. I tied on the little Yellow Palmer and sent it drifting in one of the pools. It worked its way along for a while ever so slowly until it reached a twig of a larger branch that was submerged. 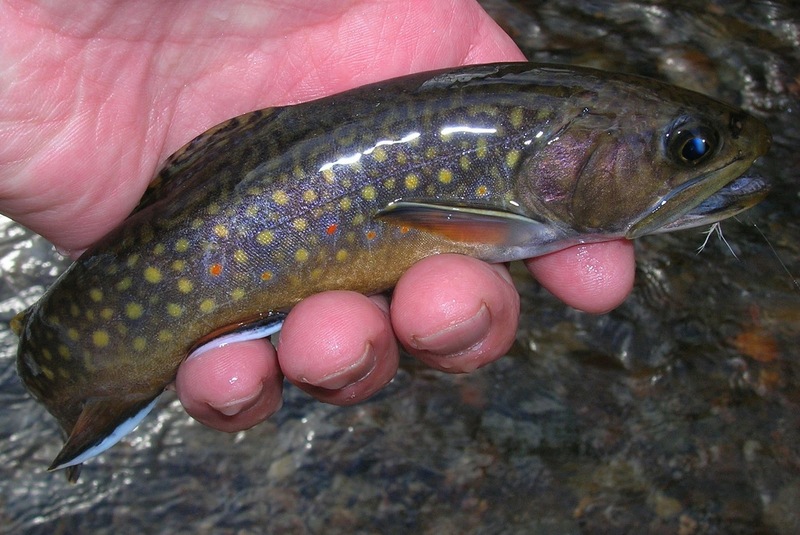 As the fly hung there for a second or two the surface exploded, soon a beautiful brook trout came to hand. The Yellow Palmer work that same way on quite a few trout that day. 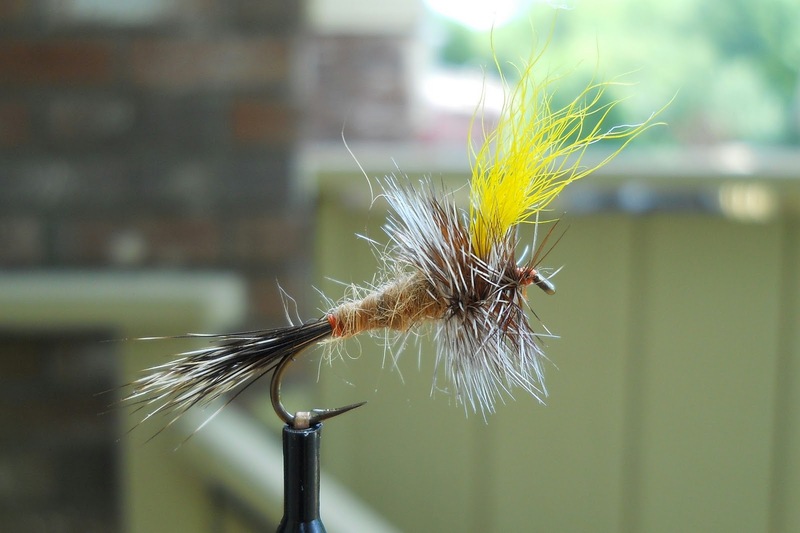 This is a fly that will be a delight to fish this spring and summer. I encountered a hunter along the stream, he was about to take flight with his meal. At home a hot cup of coffee and some pepper biscuits warmed me up very nicely. These are two simple patterns from Roger Lowe's Smoky Mountain Fly Pattern Guide. They are easy to tie and look like they would work well on the small wild trout streams I fish.